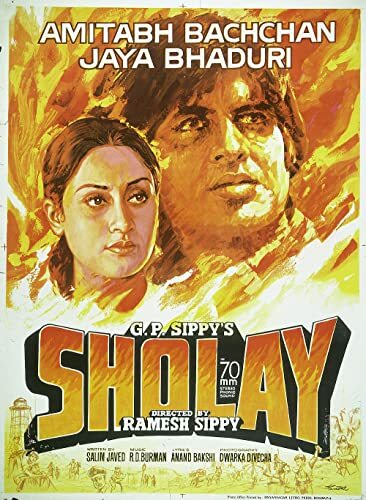 Sholay means embers in Hindi. In this particular movie, a Police Officer, who's family was killed by a bandit named Gabbar Singh, decides to fight fire with fire and recruits two convicts, Jai and Veeru to capture Gabbar. He approaches them in jail, puts the proposal in front of them, and they agree to bring in Gabbar Singh alive - for a hefty price. After their discharge from jail, they travel by train to the village where the Police Officer lives - now with only his widowed daughter-in-law. The three band together to fight one of the most elusive and dreaded bandits of all time. Will the two ex-cons be able to bring Gabbar alive to the Police Officer?Sholay means embers in Hindi. In this particular movie, a Police Officer, who's family was killed by a bandit named Gabbar Singh, decides to fight fire with fire and recruits two convicts, Jai and Veeru to capture Gabbar. He approaches them in jail, puts the proposal in front of them, and they agree to bring in Gabbar Singh alive - for a hefty price. After their discharge from jail, they travel by train to the village where the Police Officer lives - now with only his widowed daughter-in-law. The three band together to fight one of the most elusive and dreaded bandits of all time. Will the two ex-cons be able to bring Gabbar alive to the Police Officer?